It's something humans have done naturally forever- building stories with drama and meaning. The Plot Blueprint is the course for you if you want to write a great story, but you don't have all the time in the world. For more sense of how I analyze and teach plots, check out my many articles here on this website! •Hello, writers! 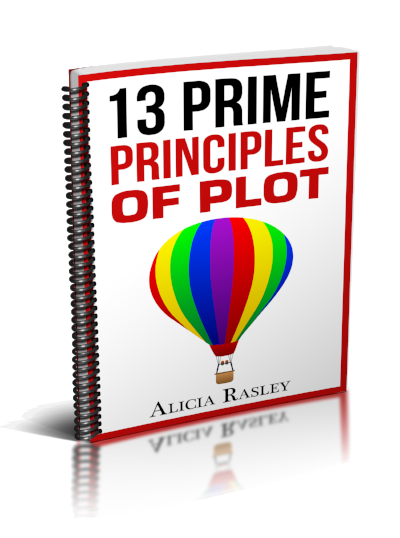 I’m Alicia Rasley, and I’d like to introduce you to the Plot Blueprint course. The purpose of this class is to guide you to take the idea you have for a story and build it into a strong and dramatic plot. I’ll give you techniques to create the foundation and structure of the plot, which will frame the intriguing characters you will develop. We’ll do this through a series of insightful exercises and examples that will have you expanding and deepening your story with powerful events that build into drama and meaning. •I know you can do this. I know you can learn to take a good idea and use plot structure and character journey to develop it into a great story. I can help you by showing you how one clever trick– breaking everything into three parts, believe it or not—can be used to amplify your idea and unify the elements. It might sound mechanical, but in my experience as a literary analyst, English professor, and story editor, I’ve gotten very analytical about story. Creativity really matters, of course, but my techniques can help spark your creativity and structure it so your plot is coherent and dramatic..
•Seriously, folks, plotting a story is easier than you’d think, because we have so many great models of stories that have worked well. I’ve been studying story structure for decades, and I’ll share with you these great tactics I’ve learned from classic writers like Shakespeare but also from popular writers like Stephen King and Nora Roberts. Let’s start with creating a good plot for a good story, and get to the artistic class stuff later. No Magic. No Torture. Just Guidance and Strategy! •I’m not one of those veteran writers who insists that plotting a story requires either a quick miracle or a slow torture. We writers like to imagine that writing is something dramatic and special and marked by magic and agony. •Sometimes we act like writing requires a miracle, that a story has to be dictated by the angels or received in a trance== that only the spiritually elite can have this special experience. •Other times, we suggest every writer has to endure the torments that we’ve endured– 20 years of going to writers conferences and writing endless drafts, starting and discarding stories by the dozens, finishing them and then despairing and starting all over again. The of course there's the constant submission and constant rejection from agents and editors. •But to some extent, we’re just making ourselves feel important. Truth is… you don’t have to do all that. I’ve already done all that, experienced both the miracle and the torture, and I’m happy to share my hard-earned wisdom with you. •You probably have already experienced success in your life, already learned how to learn, already realized the power of concentration and focus. That’s what this course is about– concentrating and focusing the main elements of building a story, so that you don’t have to waste time with trial and error and learning through the school of hard knocks. You can pick up that hammer and wrench and get to work directly on developing that idea, and I’ll help you with the plot structure and character development. You don’t have to hope for a miracle or suffer through a decade of torment to plot your story. Let’s work together on that. •So… you’re here because you have a good story idea, or the desire to create a good story. This course will help you do this, regardless of the medium– film, novel, short story, drama, game, LARP– live action role play– you want to work in.